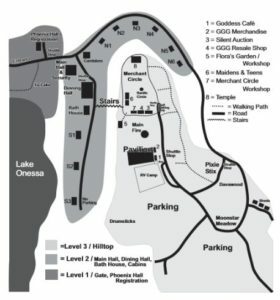 Gaea Goddess Gathering is held at Gaea Retreat Center which is a 168 acre property in a rural setting. The primary goal of Gaea Retreat Center is to provide a private, natural retreat area for a variety of people of all spiritual traditions, and to promote a feeling of connection with the land and people on it. Gaea Retreat Center is located at 25110 235th St. McLouth, Kansas 66054. There are 3 levels on which camp is built on. First level has the entrance to camp, main gate, the 12 acre lake with a sand swimming area, Phoenix Hall, Registration building, which will be your first stop when you arrive. Second level has the Main Hall, the Dining Hall, Flush facilities with heated showers, and the South cabins. North cabins are along the road up to the third level. Following the road to the left at the fork in the road and you will pass the North cabins on your way to the third level. Third level, know as the Ridge, has the Pavilion with stage. Main Scared Fire Circle, and Merchant Circle. The Ridge is where almost all Festival activities like Rituals, Workshops, and the nightly Fires and Dancing take place. The Ridge or 3rd level includes many areas for tent camping with porta potties near by. Gardens and secluded areas provide quiet places for meditation or simple relaxation There is plenty of wooded area to explore and hiking trails are maintained. Weather is an important factor at GGG. It is September and the weather can be hot, cold, or raining. Before you come out, check the local weather for McLouth. Being prepared for all weather we suggest being prepared to dress in layers Rain is in class of it’s own out here and water resistance will not work. Bring waterproof jacket/coat with a hood, rain poncho, waterproof shoes or boots, lots of socks, and an umbrella. Other things to consider bringing: a camping chair that you can carry around for the workshops, Rituals and Fire Circle; a flashlight, extra batteries, a water bottle, sun screen, bug spray, a tote bag, snacks, drums or rattles, pens and a small writing book, Ritual and fire dancing clothes, and your legal ID for registration. If you have a meal plan; bring a plate, cup, bowl, fork, knife, spoon and a bag to put your things in after you have washed your dishes. Tent camping for rain and/or cold. Bring a blanket to put over the top of your tent with a rain cover on top of the blanket. Bring a tarp that will almost cover all of your tent and don’t forget extra stakes. For the inside of your tent, bring enough blankets to able to put 2 or 3 on you air mattress under you and on top of you. If staying in the cabins there are 7 to 8 beds in each cabin and you will be sharing the cabin with other women. You will need to bring your own sheets, pillows and blankets. GGG Staff wishes for you to have a wonderful Spiritual and Fun time at the Festival.